Relax with family and friends at this fully renovated 1850’s Sea Captain’s home. Situated on a quiet tree lined street this home has everything that you your family and friends could possibly need for a spectacular Vineyard experience. This designer decorated Grecian Revival is walking distance to the harbor, restaurants and beaches. On the main level there is a large gourmet kitchen adjacent to a bright family with working fireplace. Both of these areas have vintage wood beam ceilings. A living room, dining room (each with its own fireplace), wood paneled media room and office completes the first floor. There are four bedrooms and three baths on the second floor (two of these bedrooms have french doors that lead to a second floor balcony. On the third floor you will find a large sunny bedroom / play area along and bathroom. Separate from the main house is a detached one bedroom studio with full bath. This private and serene urban compound located in the heart of historic Edgartown village is impeccably landscaped with a heated pool and hot tub. This large friendly friendly 6 bedroom 5.5 bath property includes a detached guest studio. There is also a half bath (powder room) on the first floor. In the downstairs family room there is a single pullout as well as a queen sleeper sofa. Professionally landscaped and maintained - flower beds, window boxes, lawn and gardens. Super convenient to everything in town, very large and comfortable home. This home was larger than expected, very comfortable with a large kitchen perfect for preparing meals and to gather. Live the location just steps to town. This home exceeded all expectations. This was our yearly family trip so we needed a large house to cover all the different sleeping arrangements. This house covered it all. All the adults got the own room with bathroom and the kids had their own room. It has a wonderful kitchen along with 3 different living rooms. Everyone was able to spread out and enjoy themselves. The pool was just right and the back yard was very relaxing being so close to downtown. The house was just as they said it would be and they were very good about taking care of any problem. You are only 2 blocks from town and all the great restaurants, beach and many attractions. If you rented bikes you could ride early to several other beaches. We all agreed we would love to come back again. This home is gorgeous. The grounds and exterior details are picture perfect. The interior boasts the historic details of an older home with all of the modern updates and conveniences. The location is supreme. Walk to town for shopping in dining, or walk to bus stop to visit other spots on the island. There is plenty of parking in the spacious driveway if you bring a car, but you could easily go without since this home is close to everything. Owner is very easy to work with. We'll be back!! Doesn't happen every day but isn't it lovely when something exceeds your expectations? Our extended family of ten spent an early winter weekend at 47 Cooke Street. Everyone LOVED this property, including my seven-year old grandson who walked around and then said "This is SOME house!" Three generations fit more than comfortably and every detail was perfect! The short walk to restaurants and shops was delightful. We'll be back! My extended family gathered at this amazing house in Edgartown for a winter family reunion. The house is well laid out with a variety of comfortable spaces to accommodate the various needs of a large group. The furnishings are lovely, the bedrooms cozy and beds very comfortable. The must have item for us was a large, gourmet kitchen as eating and cooking are paramount to our family gathering. This house has an amazing kitchen that allowed us to gather together, children and adults, to spend time preparing, eating, playing card games, etc in this well appointed, huge gourmet kitchen! A lot of memories were made in the kitchen alone! The location is also fabulous for walking into town. Although it was winter, we were warm and cozy in this wonderful home. All in all this house was a HUGE hit for our family reunion. 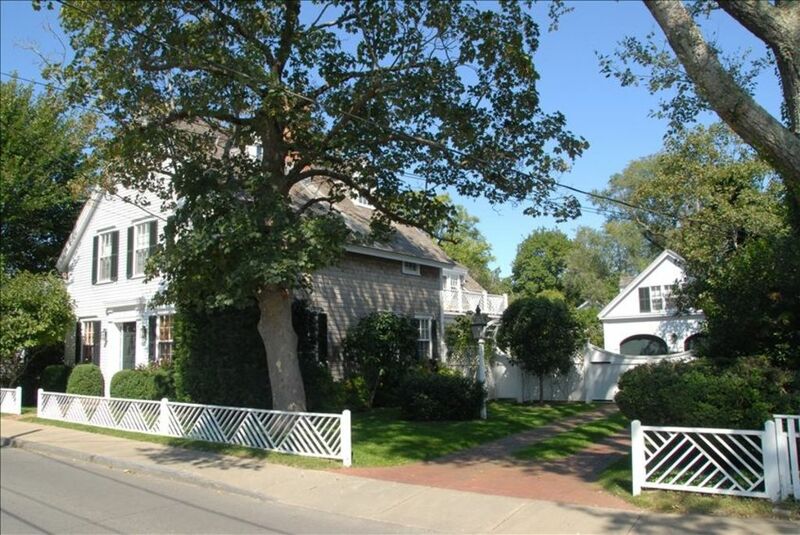 In Edgartown for a wedding, this well furnished and up to date property has everything you need for a kicking MV vacation. Walking distance to downtowns shops and restaurants. The house has ample gathering spaces for larger groups both inside and out. Kitchen is well appointed and allowed for great meals at home as well. Thank you very much for your kind words. You were great guests and we hope you will come back again. A $1500 minimum refundable security deposited will be collected by LANDLORD 3 weeks prior to arrival. Additional security deposit may be required based upon time of year and length of stay. For larger groups the basic cleaning fee may exceed $300. Preferred payment method is by fund transfer to avoid credit card fee.